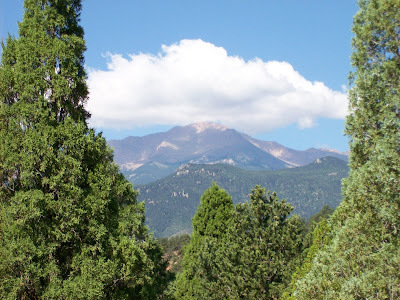 Pikes Peak from a Garden of the Gods Trail. I prepare to sacrifice my Minion to the Gods, while Acolyte Jeri looks on prayerfully. 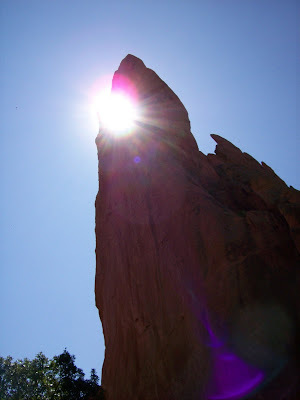 The sun through a rock formation. 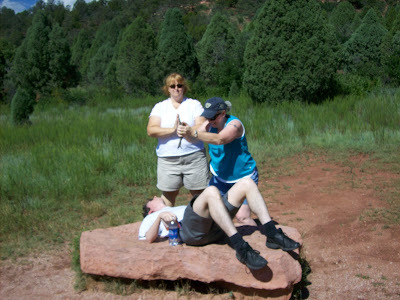 And finally, our experiences at the Garden of the Gods inspired us to visit someplace special. Someplace that made us think of certain other members of the UCF. So Jeri, Michelle and I are SAVED. SAVED, I TELL YOU! Looks like you girls are having lots of fun! Focus on the family...through a sniper scope. Sure, because you're a girl. Me, I'm not going anywhere near Colorado - in that first picture it looks like they're killing off the menfolk in some kind of Wicker Man deal. Screw that. Really. Jim, you have skills. I think you'd be a bit difficult to sacrifice because you would't lie still for it. Unless we hypnotized you with our own trollopy powers. Janiece wouldn't really sacrifice Michael. If she did, then she would no longer have a minion. Anybody else notice the little yellow sign on the lower left corner of the Focus on Family sign?? Wish I was there, having hell week at work. Bleah. I definitely wanted to be there (even for the sacrifice of the minion part. But then I saw the last picture. Yikes -- runs in the opposite direction, quickly! I wouldn't really sacrifice the Fabulous Michael. He is indeed a fine minion. And I do wish the rest of the Trollops were here with us. So we could tell James Dobson and his ilk to focus on his own damn family. IT does tend to wear off like one of those temporary tattoos. Most don't survive the drive home from church. Jim, what, the Cheney's put scopes on their shotguns (their preferred weapon of choice to shoot family members and friends)? That just cinches it for me. Poor, poor Michael. Did your minion displease you so that you felt the need to scare him straight? And I do wish the rest of the Trollops were here with us. I was wishing that too...until I saw the last photo. I think I would've burst into flame if I had gotten that close to the sign. Or I would've brought spray paint cans. Purely for artistic purposes, of course. So we could tell James Dobson and his ilk to focus on his own damn family. I'd focus on Dobson's family...jewels, as I kicked them into a fine mushy paste. Looks like a good time was had by all judging not only from the pictures but from the satisfied look on everyone's faces last night. Hope everyone makes it back to their places of origin today...I'm sad to see you all go and next time I'll get to trollop along with you more. Stacey, I spend my day around engineering geniuses - I'm sure one of them can supply me with an instrument that can locate tiny shriveled things that have no purpose. Which I can then kick into a fine mushy paste.